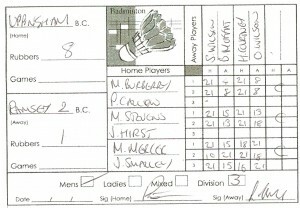 Another solid win for the Hunts and Peterborough Mens 6, this time against an under strength team from Ramsey, whom only managed to field two pairs for their trip to Uppingham. Uppingham fielded Jack and Matt Mercer for their second outing this season, Mark B and Paul C continued their very strong partnership and Matt Stevens partnered ‘new boy’ James Hirst for his first run out for the Hunts team. With Ramsey conceeding three games before play began, the match was secured by Uppinghams first two pairings, both quickly wrapping up their opening matches to hand the home side an unassailable lead. Finishing with a final tally of 8 games to 1, maintained Uppinghams unbeaten season at this level with only one match standing between the side and a second successive clean sweep. With promotion now established beyond any doubt, next season will prove a tougher proposition.